Vasily Polenov with the help of his pictorial paintings reminds us how beautiful the nature is in any of its manifestations. It was landscapes that became the main motive in the works of the artist. After Polinov acquired an estate near the Oka River, the author did not leave the author for a minute. 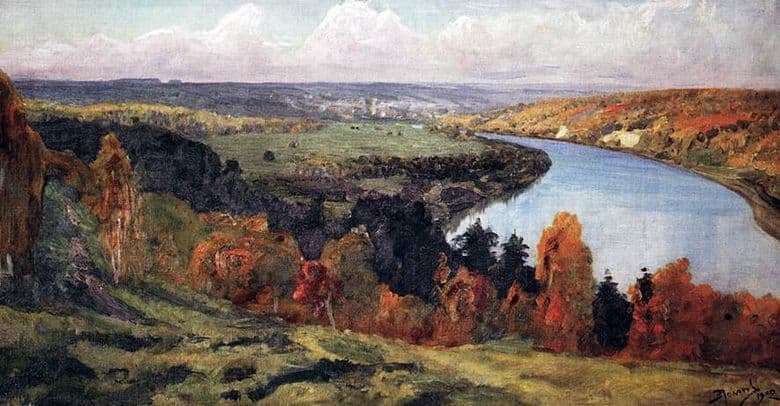 Being among the beautiful forests of the Tula province, Vasily Polenov presented the world with many wonderful paintings depicting various natural landscapes. One of the main works of the artist is the painting “Oka Valley”. We have a panoramic view from a high hill over the valley along which the famous river flows. For writing the picture Polenov used oil, due to which one can see the clear surface of the water and the thrill of each leaflet located on the trees along the sandbar. Vasily Polenov painted many paintings on a protruding hill above the valley, depicting a picturesque river at different times of the year. In the painting “Valley of the Oka” is clearly seen the beginning of autumn. We see a warm, clear day, a calm transparent river, a blue sky with white clouds above the valley. Practically everything around is shrouded in greenery, but a certain line of trees with yellowed foliage is already visible. Very little is left and soon the sky will be covered with gray clouds, because of which the water in the river will appear dark and muddy, and the nature will turn yellow-golden. The author very accurately conveyed this inevitable sense of change. Looking at the picture “Oka Valley” I want to delay a little more summer and enjoy the last warm days. The landscape does not depict people, animals or birds, there is nothing living on it except the indescribable beauty of the Russian hinterland. Nature seemed to stop, trying to keep this moment in the memory of everyone who watches her.